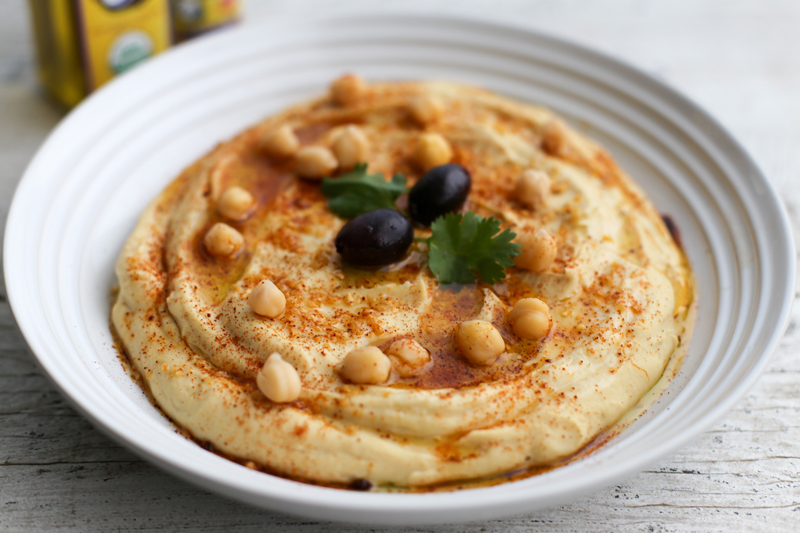 Homemade hummus is way, way better than the store bought variety, especially when you make it with Garlic Gold®! It’s thick, rich, and full of roasted garlic flavor, perfect for spreading on pita bread or dipping with carrot sticks. We make our hummus the classic Mediterranean way in three simple steps. First we cook the garbanzo beans until they’re soft and tender. Next, we whisk together a creamy, light sauce from tahini, lemon juice, and Garlic Gold® Oil. This “tehina” sauce is great on its own too — drizzle it on roasted vegetables or falafel if you like! Finally, we blend up the sauce and the cooked chickpeas while they’re still piping hot, for the smoothest, creamiest hummus ever. For a special touch before serving, drizzle your hummus with a generous amount of Garlic Gold® Oil and a sprinkle of our crunchy nuggets. It’s a perfect appetizer or snack anytime! Soak the garbanzo beans. Place the garbanzo beans in a bowl, then add water to cover by two inches. Stir in the salt. Let the beans soak for at least 8 hours, or overnight. Cook the garbanzo beans. Drain the beans. In a 2 or 3-quart saucepan, cover them with fresh water by two inches. Bring up to a boil over medium heat, then turn down to low and simmer until the beans are soft and cooked all the way through, about 1 1/2 hours. You can test one of the beans by slicing it down the middle. It should have no chalky white core, and be a solid tan color all the way through. While the beans are cooking, make the tahini sauce. In a small bowl, whisk together the lemon juice and tahini. The mixture will sieze up, then form a thick paste. 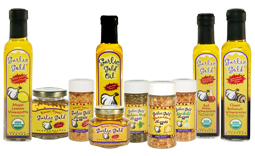 Drizzle in the Garlic Gold® Oil and continue whisking into a smooth sauce. Whisk in the cumin until thoroughly combined. Make the hummus. Drain the beans, reserving a cup of their cooking liquid. In a food processor or high speed blender, combine the piping hot garbanzo beans with the tahini sauce and the reserved cup of cooking liquid. Process until very smooth, about one minute. Taste it for seasoning, adding more salt if desired. Chill and serve! Pour the hummus into a serving bowl, then let it firm up and chill in the refrigerator, covered, for at least two hours. When ready to serve, top the hummus with a drizzle of Garlic Gold® Oil and a sprinkle of Garlic Gold® Nuggets (plus olives, paprika, and/or cilantro if you like). Serve it with sliced vegetables or wedges of pita bread and enjoy! Roasted Garlic Hummus: direction #3 – Where or how do you get the tahini to make the sauce?